The only thing I'll be tackling today I think, is the icepack! I am hoping though, that after putting ice on it off and on for a few hours this morning, I'll be able to do a few dishes and start a load of laundry. The kids can get it put away, if I can just wash it and get it in the dryer. I made it to the chiropractor yesterday, but still am having a hard time walking today. I know it will take time. Some of this post is a repeat, since I just got yesterday's daybook posted today, but I'm trying! Little Miss Princess turns 5 on Thursday and I need to get her last present and get the stuff for her cupcakes. She wants pink icing with pink sparkly sprinkles. I am going to make a bunch, and put some of them in the shape of a number 5, like I did with my two June birthdays last year. It's very cute and very economical! I just pray that I will be able to make it to a store to accomplish this in the next couple days. God has been so good to me through this, just like He always is. He's teaching me to trust in Him in the good times and the bad, and always look to Him FIRST for EVERYTHING. Even through my tears as I've crawled around the house and went to church on Sunday, I have been praising Him for all the good and all the bad in my life. I'm so thankful that I'm a child of God...I can't imagine going through life without Him! 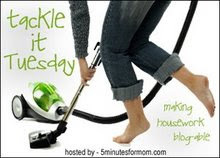 For more great Tackle It Tuesday Posts, go to www.5minutesformom.com ! Oh, so sorry, about your back! I didn't realize you were down again. I will be praying for you! I know all about the pain and the crawling. Well, I hpe you accomplished all that you wanted. And I hope you are feeling better at the end of the day then you were this morning. Thank you all! I didn't get it all done, but I was walking by afternoon and with hubby's help, we made it to the store to finish getting things for my daughter's birthday. I actually walked through the store! I have heartburn now from my back brace being so tight, but I walked!